320i 1.8 and 318i 2100cc Performance street Engines. M20, S14 and Big 6 Engine work and components. JE Forged piston sets for all BMW engines. Total Seal Gapless rings for all BMW engines. Yes we build complete engines for all years of 1600, 2002, 320I, and E30 318I. Anything from a stock rebuild to a 300+ HP Turbocharged Monster. All our engines are built to order. We are not a production engine rebuilder. All engines are treated as individual projects and afforded the attention needed to make then outlast and outperform any other engine available. We prefer to build the engine core that was in your car, but we will supply engines on an outright No-Core basis when the need arises. Need help planning your engine Build or Parts Pacakge ? Click here to tell us about it, and we’ll tell you how we can help. We have been Building BMW Engines for 30 years. We are very good at it. We build Fast and Reliable M10, M20, M30, S14, S38, M50/S50 engines for customers Worldwide. Complete Parts Packages or Individual Components. 80% of the engines we build fall into one category. Normally Aspirated ( Carb or F.I. Non-Turbo ) Performance street engines that need to run on Unleaded Pump Gas (92-93 Octane). For those of you looking for a full on Race engine , I.T. Legal Race Engine or a Turbo Prepared engine please contact us for specific info and to discuss your needs. Need help planning your engine project? Click here to tell us about it, and we’ll tell you how we can help! All Top-End Performance engines, from stock to GT Road race, go through the same basic processes. We do not cut corners. All cylinder heads are pressure tested and inspected for cracks. All Engine blocks are Hot Tanked and Magnafluxed for cracks. Cranks are cleaned and measured for journal size and roundness. Con rods are check for straightness and magnafluxed for cracks. We are clean freaks when it comes to engines. All parts are hot tanked or cold tanked as needed. All Aluminum parts are bead blasted to look as new as possible. We do not paint Aluminum parts like heads, timing covers, oil filter housings, etc. We do offer various coatings for valve covers depending on what you want. Since we replace everything else the inspection process is not that tough. All block assemblies get . On stock engines. Performance engines get all new Stainless Steel valves. Either stock or your choice of performance grinds. We prefer to use the E12, E21 or 18I head castings. The 121 casting is very restrictive due to the small valves, shrouded chambers and poor port flow. For the sake of originality we will use the 121 casting on Tii applications. We can put the larger valves into it and open up the chambers to simulate the E12 casting. The Newer the casting the better. The year is cast right into the head so it is easy to tell how old it is. Our block and head work is done in house on top notch equipment run by a machinist that is intimately familiar with BMW engines. Not another one of these Chevy or Ford guys that has never seen one of those pesky foreign cars. All blocks are bored and honed with a Torque Plate. All blocks are surface decked for flatness. All con rods are Re-sized on the big ends and re-bushed on the small ends. All crankshafts are micropolished and the oil holes are chamfered and detailed. Any crank that gets re-ground is heat treated. 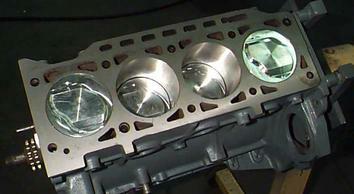 All Cylinder heads are Blanchard ground Top and Bottom with the upper timing cover in place. All valve jobs are 3 angle grinds. All valves are then Hand lapped and back-cut for max flow. All Engines are dynamically balanced from front pulley to flywheel. Balancing is not an option. It is always done. These are the basics that go into every complete engine we build. 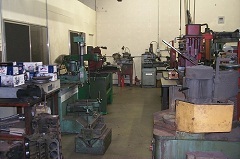 From here we can modify the components and machine work to come up with a combination that suits your needs and budget. Here are some examples of the common engine combinations we offer. One of these may suit you perfectly or we can do a custom package. All engines listed are built as Long Block assemblies. This means . Valve cover to oil pan less all external accessories like intake manifolds, exhaust manifolds, alternators, brackets, doo-dads, etc. All engines do include a New German water pump. Prices listed are based on using your good core either shipped to us or brought in already removed from the car. It assumes a rebuildable engine with a non-cracked head casting. We have a full shop and can due all the engine R&R work as well. That labor is not reflected in these prices. 2002 Performance Street engine for use with 2 barrel Weber carb and stock intake, Tii or Stock 320I C.I.S., 318I L-Jetronic or Mild Electronic F.I. Conversion. These engines idle great and get very reasonable fuel economy for the performance delivered. Compression ratios of 9.5:1 and our 284-288 camshaft profiles. Mild street porting on the heads and intake manifold porting on the 2 bbl cars. 91mm bore for almost 2100cc displacement gives great torque increase across the power band. ALL BMW M10 Engine build prices are based on you having a Re-Useable or Rebuildable Oil Pump in the engine core..
2002 or 320I Performance street engine for use with Dual Sidedraft Weber carbs or aggressive F.I. conversion like dual sidedraft throttle bodies. Slightly lopey idle at approx. 1000-1100 RPM. 9.8:1 compression ratio. 91mm or 92mm big bore for 2100cc + displacement. Aggressive Street Head porting. 294 to 306 camshafts. Race prep on rods and crankshaft. Heavy duty dual valve springs. Mandatory use of Ignition upgrades. Tii Distributor. MSD Ignition package. Header. High flow muffler and pre-silencers. 2.25" exhaust pipe. From $4900 with Race prepped stock rods or from $5500 with Forgted 4340 Rods. 320I 1800 150-160HP engine build up. 2100cc conversion for use with stock CIS or L-Jetronic F.I. system. This is the engine that makes it worthwhile to own an E21 320I or E30 318I. 2.0 crankshaft fitted to the 1800 block and rods with custom 92mm big bore pistons to take advantage of the 18I head and yield a 9.8:1 2100cc powerplant that makes a ton of torque and offers amazing driveability throughout the power band. Special cam profile for use with stock injection system gives good idle quality with great mid range and high RPM punch. When coupled with the stock exhaust manifold, a High-Flow Catalytic Converter and High-Flow Rear muffler, Ignition and Air filter upgrades it is no problem to make . Addition of header negates smog laws in most areas. Everything we do for the M10 engine we do for the S14 and 6 cylinders as well. Obviously the prices are different. Please contact us and we will get you a price for your particular project. As we all know that is has become impossible to get oversize high compression pistons for all the older BMW engines. Years ago we started compiling blueprints and combustion chamber molds for all the combinations of head, crank, blocks, etc. We can supply you with pistons in any bore size or compression ratio for all M10, M20, S14, and Big 6 engines. I addition we can custom make pistons to any configuration you might want. 7:1 to 13:1 ....89mm bore to 96mm bore. Whatever you want. Includes Wrist pins, Pin fitting, pin locks and Total-Seal Gapless Rings. Ready to hang on your rods. There are also options available for these piston sets... Add amount to set price above. It does not matter if you are doing a stock engine rebuild or building a race engine. Ring seal is directly related to power. The more compression you can keep in the hole the more power you will make and the less oil you will consume. TOTAL-SEAL GAPLESS RINGS ARE ALL WE USE IN ANY ENGINE WE BUILD. All our cams are available either as re-ground on stock cores or as NEW Billets. The 302, 316 and 328 require the use of lash caps. All cams are re-hardened and will have the same if not better life than the original unit. All reground cams are sold on an exchange basis with a $100.00 core charge if we happen to have a core available in stock. We can also grind your core. Turnaround time on cam grinding is 3-4 days. We have more grinds than just what are listed here. We have all the Euro cam masters as well as a variety of other upgrade cams that we can do.